Complete size range (100pcs): 4mm/31g, 4mm/32g Ultra, 5mm/31g, 6mm/31g, 8mm/31g, 10mm/29g, 12mm/29g. 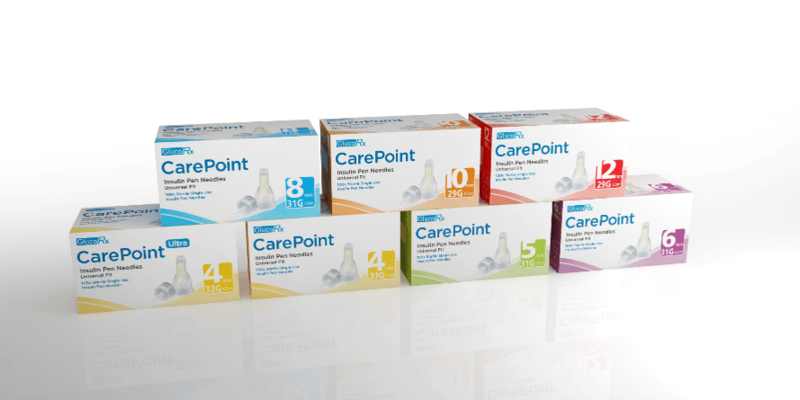 Universal fit on all insulin pen delivery devices including Eli Lilly®, Novo Nordisk AS®, Becton Dickinson®, Owen Mumford® and Sanofi®. Pen needles are electropolished with high grade siliconisation for enhanced ease of injection. They use MaxflowTM technology (extra thin wall allows maximum flow rate and reduced injection time) and so are anti-coring (no fragmentation). Quality pen needles, without the cost. Both these insulin pen needle ranges are currently of 3 bevel specification. 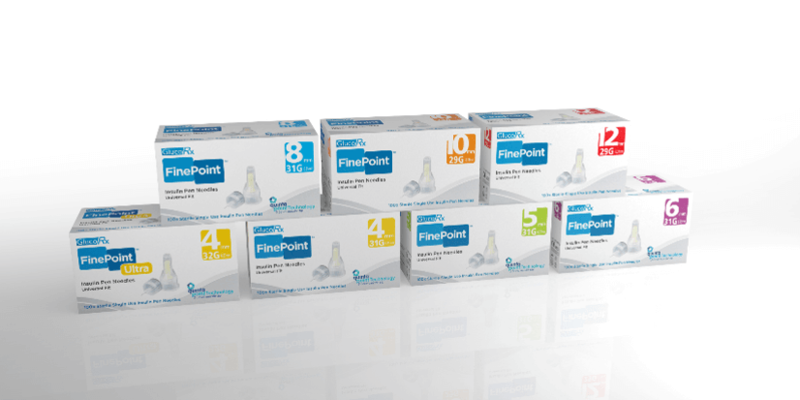 By 1st April 2018, the old 3 bevel 4mm, 5mm, 6mm and 8mm GlucoRx FinePoint will have been phased out and replaced by the new 5 bevel GlucoRx FinePoint Quintapoint (10mm and 12mm will remain 3 bevel). 5 bevel insulin pen needles will provide a higher level of comfortable injection to patients. Download Pen needle Compatibility Chart.